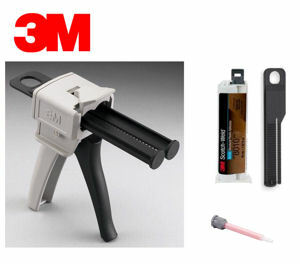 3M EPX Plus II Applicator w/ 3M DP 8010 Adhesive 45ml , 10:1 plunger, and 10:1 mixing nozzle (orange nozzle) . Everything you need to dispense properly come right out of the box with applicator, plunger, and mixing nozzle. 3M™ Scotch-Weld™ Structural Plastic Adhesive DP-8010 is a two part acrylic-based adhesive that can bond many low surface energy plastics, including many grades of Polypropylene, Polyethylene, and TPO’s without special surface preparation. It can replace mechanical fasteners i.e. screws and rivets, and plastic welding that typically require two-step processes which include chemical etchants, priming or surface treatments in many applications prior to bonding. - Unlimited assembly possibilities - including assembly of Polyethylene and Polypropyline to themselves and other materials such as plastic, metal, wood, etc..
- Tough bond strength to resistant vibrant and impact.